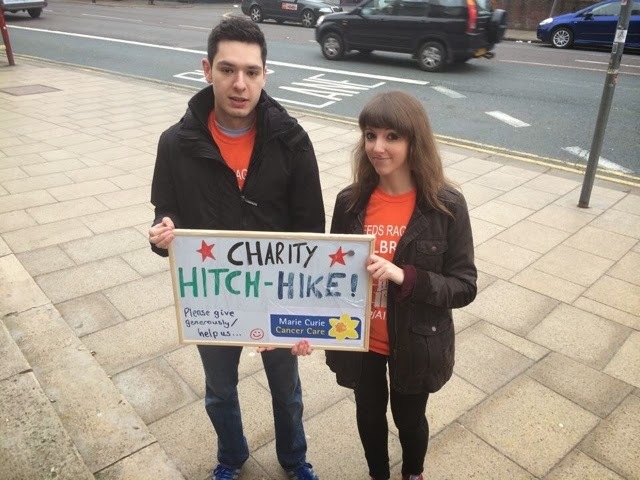 This year, my housemate Rosanna and I took part in a charity hitch hike challenge called Leeds RAG Jailbreak. The idea was that we had 36 hours to get as far away from Leeds (in England) as possible. The catch was that we weren't allowed to spend any money on transport at all: that meant hitch hiking, trying to get free public transport and relying on donated tickets for our whole journey. The aim of the Jailbreak was also to raise money for charity; it's well known that events are the best way to fundraise and collectively we raised about £600 for Marie Curie Cancer Care in the process. It was Monday, 31st March 2014 at 9am and we gathered on the Parkinson steps at Leeds University ready to go. Our plan was quite optimistic: to get down to Leeds train station, get on a train from East Coast (as we had heard that they were helpful in previous years) and arrive in London a couple of hours later. In London we would spend all day fundraising in tourist-filled areas and then get a flight to somewhere nice the following day. We had until Tuesday, 1st April 2014 at 9pm to do this. Would our plan work? 9:00 - the klaxon sounded and we were off! We took a shortcut through Leeds Uni on the way down, instead of taking the more direct path straight down the hill to the train station, as we knew everyone would be going that way. As I mentioned earlier, the goal was to ask East Coast trains for a ticket. We arrived at the customer service office and two Jailbreak groups were already ahead of us and at the office. The group at the front was on the phone to someone at East Coast; we split and Rosanna went to ask someone else whilst I stayed with East Coast. The front group got told no by East Coast so we moved on. Rosanna spoke to someone at the station who said it'd be best to ask individual train conductors. So that's what we did! The plan now was to get a train to Sheffield, but a train to Manchester Airport turned up first while we were waiting. Who could say no to that? We asked the guard if we could get on, she said yeah and we were on our way to Manchester. We met some nice people on the train and even got a donation from a fellow passenger. Over an hour later we reached Manchester Airport. We then spent the next three hours going from airline desk to airline desk across three very spread out terminals, walking miles and miles in the process. We called all kinds of media contacts (and I have the phone bills to prove it) but all to no avail. No one could help us with a flight at all. It was really disheartening, but I think it made us want to persevere more. So, we blagged a train back to Manchester Picadilly and then walked to National Express' coach station. They couldn't help us and suggested we try Megabus. When we got to the Megabus stop, they (reluctantly) let us on the bus to London. We were warned it was indirect and that if other people got on with paying tickets at Birmingham or Coventry we'd have to get off. We were perfectly happy with this arrangement (though I was secretly terrified on ending up stranded in Coventry where transport links aren't incredible). We assumed this bus journey would take four hours. It didn't, it took six hours! So dire. We had made plans when arriving in London to go and fundraise outside Wicked, the musical, in Victoria. Our plan was definitely to fundraise no matter what happened by moving onto Piccadilly after the show started and trying to catch some tourists there. We arrived in London too late to do our Wicked plan so we grabbed some food from McDonalds before heading to a hostel. We had a bit of a disagreement in McDonalds about what we'd do next which was inevitable after being in each other's proximity for so many hours. With that over we walked towards the hostel. We needed somewhere to dump our bags and we wouldn't be leaving London that night, so it was a worthwhile investment. I'm not sure what happened but we never stuck with our hostel plan, probably because on the way there we came across a load of B&Bs. "Let's try and get a free B&B in the name of charity" we said, following the lead that at least one other group had done this. That was in Manchester however...this was London. Trying to get a free room was a complete failure and no one would help us. We saw an easyhotel here and just took it after trying to get it for free. £20 each for a double room - very basic but comfortable and we needed somewhere to leave our stuff. 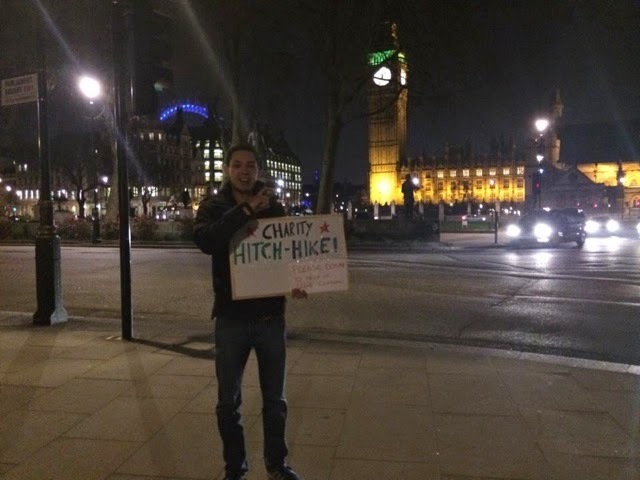 After adapting our hitchhiking sign to a fundraising one we set off. It was now pretty late: around 10pm and we has missed most of the crowds which was a bit annoying. However, our plans developed and we both thought it a good idea to try pubs - drunk people with money in their pocket who might be 'jolly' enough to donate. We went to the Shakespeare pub in Victoria first, and asked the manager if it was ok to fundraise in there. Given the all clear we spent about 15 minutes in there and got around £10-£15 which was a great start, though we'd need a lot more if we were going to be able to catch a flight. 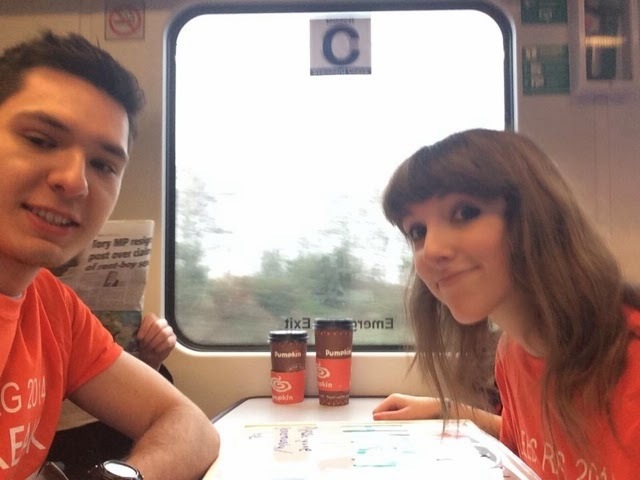 Rosanna said she wanted to make it very clear that the money given to us would be towards flights and we were very explicit about that to everyone, giving them the option of donating money to Marie Curie on the side as well. Knowing London pretty well, I said our best bet for pubs nearby was to walk down through Victoria, past the Houses of Parliament and try all the pubs on Whitehall (there's quite a few). Along the way I remembered the Albert pub, which became our next stop. What a great decision - with a bit of patter, speaking to a family from the US and then a couple from Scotland we made about a tenner. Then it was onto a group of businessmen who gave us a pound each and them finally onto a group of three businessmen stood away from everyone else. Here we spent about an hour chatting to them, getting tips on hitch hiking and (as they tried to outbid each other) we made over £60 in total at this pub. Tim, one of the nicest people I have met, really helped out with money, giving us hitching tips and info on how to get cheap flights AND he also told us that all pubs would close at a certain time in Westminster. That time was approaching fast. By the time we left, all the pubs had closed. Gulp. We weren't done yet and so popped into a few more bars around Soho and then walking back to Victoria through the pounding, torrential rain (who said this was going to be easy?). We went back to the hotel and counted our pennies and pounds; we had raised a grand total of £92 that evening. We'd also been donated £3 throughout the day and someone had donated £2.50 to Marie Curie specifically (not for our travels). Almost £100 in just a few hours. We hoped that it would be enough for a flight. We looked for flights online (it was my first time using the "Anywhere" feature on Skyscanner which was rather exciting), and saw that Oslo was only £30 each but for £14 more we could make it all the way to Nice in Southern France. Plus the difference in temperature was between 7 degrees and 17 degrees, and from Nice we had more of an opportunity for onward traveling due to speaking French. Very excitedly we booked tickets to Nice for 7:40am that morning. Check out Part 2 to find out how far we got.